Life is getting strange in Twombly, Illinois. Jairus Twombly's familial intuition is faltering and his new personal assistant seems to be trying to replace his wife, Amy. On the Twombly College campus, someone is breaking into the dorm rooms of female students leaving things instead of taking things: red colored objects including a red golf ball, a red ribbon and a tiny red stuffed dog. When a recipient of some of the red objects goes missing and is returned after being told, "You're not her", and the personal assistant turns up dead with Amy Twombly's elegant Bloodwood crochet hook in her eye, things heat up for Emory Crawford and her chemist and forensic scientist husband, Dr. Jebbin Crawford. Emory, along with the Twombly's Nancy Drew-like daughter, Madison, once more turns to her amateur detective skills and intuition to solve the mysteries. As an artistic person who at one time went to college to become a professional artist or an art teacher (neither panned out) how the covers for the Emory Crawford Mystery Series would look was very important to me. And I was fortunate in that my publisher, Promontory Press, as an independent publisher, is willing and able to let their authors be a part of the cover creation process. The first book in the series, The Devil’s Music, is heavily influenced by folk and bluegrass music. Emory is a bluegrass fiddler and her husband Dr. Jebbin Crawford is a banjo player. They know Dr. Archibald Finlay Dawson – another fiddler and the victim of the story – though bluegrass festivals and jam sessions. Archie is the keynote speaker at a conference where he’ll be discussing his New York Times bestseller about murder songs down through the years. I knew I wanted a fiddle/violin on the cover since the strings from Archibald’s special five-string fiddle are the murder weapon. Oh! I heard some of you thinking “What’s the difference between a violin and a fiddle?” I once had an old bluegrass fiddler explain it this way – you don’t spill beer on a violin. Other than a slight difference in the curve of the top edge of the bridge, and that only occasionally, there is no difference in the instrument. The difference in name is a result of the kind of music played. With formal music, symphonies, concertos and such the instrument is referred to as a violin. With casual music, dance music, folk music – what might be seen more as music of the common folk – the instrument is called a fiddle. So, I knew there had to be a fiddle on the cover and I knew I wanted brown and gold tones to be dominant. From there I was offered a few different fonts to get a feel for the style I might like. Then the amazing artist Marla Thompson at Edge of Water Designs came up with the cover for The Devil’s Music with the 1800’s looking font, the fiddle, the browns and golds, and the aged looking faded sheet music for the background. Oh – and a few dribbles of blood. Her design is uncluttered and elegant and I love it – as has every person I’ve talked to about it. I took a photo of my Bloodwood hook and that is the shot used for the cover.  Then Marla used the same 1800’s font for the title and found the shots of a crocheted table cloth, some crochet work in progress and just the right amount of blood spatter on the hook end of the murder weapon for the rest of my second elegant book cover. 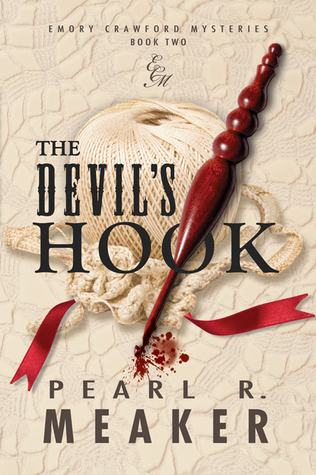 And again, people always ooh and ah over The Devil’s Hook cover. 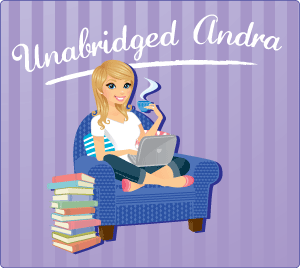 If you are needing a book cover, promotional material or a logo designed for your work, and you like what you see on my books, I highly recommend checking out Marla’s work at Edge of Water Designs . Marla also worked on my book trailer, which you can view on YouTube. At about time for lunch break, we heard the upstairs door open and close followed by Tracy and Suzanne pelting down the stairs into the family room. “Sorry we’re late, Emory,” Tracy puffed. “Campus security is finally going to do something about it all,” Suzanne gasped out in one breath. “What?” said the class in Greek chorus unison. “Red things appearing, not taken?” I asked. The group moved up the stairs, the two boys in the lead. I could hear Amy Twombly grumping as she went. I started getting the two girls settled down and learning the pattern. But my brain was not fully on the stitching. The last time something around here got left where it shouldn’t have been it was a strange dried flower arrangement on the welcome table for a conference and soon after, there was a murder. Pearl R. Meaker is an upper-middle-aged, short, pudgy homemaker, mother, and grandmother who in 2002 became a writer. Initially writing fanfiction she soon tried original fiction at the encouragement of her regular readers. She has been a life-long lover of mystery stories and automatically went to that genre for her first book, The Devil’s Music. She and her husband of nearly 40 years live in central Illinois. They both love bluegrass music, playing fiddle and banjo and singing. Pearl also does many crafts – when she’s not reading or writing - knitting, crochet, origami, needlepoint, and cross-stitch among them. 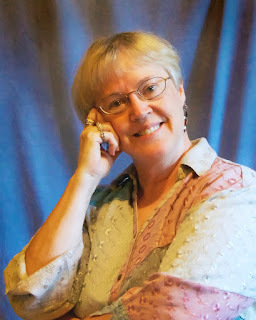 She also enjoys birding and photography and is a former fencer. Pearl will be awarding a $25 Amazon or Barnes and Noble GC to a randomly drawn winner via rafflecopter during the tour. "... “What’s the difference between a violin and a fiddle?” I once had an old bluegrass fiddler explain it this way – you don’t spill beer on a violin...."
Love it. Makes total sense to me, LOL. I am so excited to read this book. Andra, thanks for the intro. You always have the best writers on your site. I hope I signed up for the Pearl & Emory newsletter. If it didn't go through, my email is jozywails@gmail.com. What would you change about yourself if you could? Hello Mai - sorry I'm so late replying. At one time, I would have said I wanted to change most everything about myself, and there is still quite a bit. I have a poor self image and problems that have made dealing with the everyday issues of life difficult at times. I have ADD/ADHD, chronic depression and a tendency toward just plain negative thought patterns. But, of late, perhaps it is a gift of getting older, perhaps it is because of writing my two novels, I'm starting to do better at appreciating myself. I'm doing better at battling my negativity. The cover has me drawn in. I would pick up the book based on the cover alone but the story has me hooked. Thank you so much, Deanne! I'm glad both the cover and excerpt have you hooked :-) Let me know how you like it after you read the whole story. It is a great cover. I'll never look at my crochet hooks the same way again. Hehehe! I know what you mean, Mary! I think of it every time I use my Bloodwood hook - even though it is one of the most comfortable hooks I've ever used.